Many have written on the symbolic relationship between the end date of the Mayan Calendar and the Galactic Alignment. This article will focus on the Galactic Alignment of 2012 from a very different perspective, that of the symbolic and metaphorical teachings of ancient Egypt, which formed the foundation and guiding force underlying all of Western mysticism. Symbols, myths and metaphors, contain within them the potential to arouse numerous intuitive connections and associations within the viewer. Utilized throughout antiquity in traditional civilizations across the planet as part of their esoteric and initiatory teachings, symbols were developed to open the heart and intuitive faculty, to evoke awareness of, contemplation upon and insight into the forces that weave the outer fabric of the universe and the inner fabric of the human being. They were part and parcel of the body of knowledge that is known to us as Sacred Science. By weaving together myth, symbol, science and contemplation it is my hope to bring you to a new awareness of the significance of the transformative power of the Galactic Alignment from both a personal and universal perspective. On December 21, 2012, the Earth will line up with the Sun and the Center of the Galaxy. From a symbolic perspective what does this mean? In this article, we will begin to unveil some of the esoteric teachings found at the heart of this Galactic Alignment by exploring the ancient Egyptian myths and symbols associated with Isis and the Center of the Galaxy. Ab-a en mut-a Auset. My heart, (is of) my mother, Isis. “I am she who separated the heaven from the Earth. I have instructed mankind in the mysteries. I have pointed out their paths to the stars. I have ordered the course of the Sun and the Moon. I am queen of the rivers and winds and sea. I have brought together men and women. I gave mankind their laws, and ordained what no one can alter. I have made justice more powerful than silver and gold. I have caused truth to be considered beautiful. I am she who is called the goddess of women. For the Egyptians, the Center of the Galaxy was symbolized by the Great Goddess Isis in her role as the Mother of Creation. To them, she was the prima materia and the secret womb of all that is. She represented the source of the great outpouring of cosmic rays, dust and other rare elements that make up the material that our scientists have detected spewing out from the Center of the Galaxy. The huge gravitational pull of this center produces a vorticular shaped galactic formation that looks to us like a pinwheel. This vortex of stars is continuously emerging from and spinning around the center. The vast curving arms of the Milky Way are formed from the dust and particles that emerged from the Center of the Galaxy. The Center of the Galaxy is so immense that its size is more than one million times larger than our Sun. Once of the great secrets of ancient Egypt is that the Center of the Galaxy is the secret Sun that exists behind the Sun. In alchemical language the Center of the Galaxy was also called the Black Sun, the Hidden Sun, or the Invisible Sun. It was the secret Sun of the Eternal Feminine, the Soror Mystica. But viewed through the lens of symbolic thinking a statement such as this and the image of Isis herself may contain infinite levels of information, hidden to our untutored eyes. It is worth noting here that the word Sun as written on the Temple of Isis at Sais is spelled S-U-N referring to the great yellow star that nurtures and warms our planet. Egyptian myth tells us that Horus, the divine child seen suckling upon her breast, is the son of Isis and her beloved consort Osiris. But according to the ancient Egyptians, Horus also symbolizes the Sun that shines in our sky. Through this simple use of symbol and metaphor, the Egyptians are telling us that Isis, the center of our galaxy, gave birth to our radiant yellow Sun. Horus, the son of Isis and Osiris, is both the SON and the SUN. Horus is the representative of his father Osiris. The energy of Horus within us, awakened and invigorated by Isis, becomes the rising up of the will to complete the Great Work and attain full enlightenment in this lifetime, a process that the great Egyptian scholar Isha Schwaller de Lubicz called “willed superevolution.” 1 If Isis is the Center of the Galaxy then it is only natural that her son is our Sun. Centuries later the myth of Isis, Osiris and Horus was recast by the Christians as the Virgin Mary giving birth to the son that redeems mankind. Through this mystic story of the Virgin Mary and her son Jesus, the myth of Isis and Horus, of the Great Mother giving birth to the Child of Light, was reborn into our modern age. It is a strange and fascinating aspect of Christianity, this recasting of the mythic figures of Egypt into new symbolic expressions of the old Gods and Goddesses. Frequently, the Black Madonna’s were made of volcanic, black rock that comes from deep in the Earth. From this perspective the Black Madonna represents the prima materia or first substance, the original substance from which all alchemical transmutation manifested. Thus she arose directly from the very matter that makes up our planet. She holds her son in her arms, exoterically depicting the baby Jesus, but esoterically representing Horus, the son of Isis and Osiris. Hidden deep within the occult mysteries of the Christian tradition we discover a symbolic representation of the Center of the Galaxy giving birth to the Sun. As we have seen, the inscription on the temple of Isis at Sais states that the fruit she has brought forth is the Sun. Our radiant local star eventually emerged from the dust that escaped the throes of the fiery furnace, which lies at the center of all creation in our galactic neighborhood. Indeed, it can be said that everything that is, all of nature, human beings -even human consciousness -comes originally from this womb of the galaxy. If she is Isis, then our galaxy is the Great Mother, the creative, feminine force from which everything emerges, her pregnant womb continuously giving birth to millions of Horuses, or stars, that shine brightly on her heavenly body. This knowledge of the inner fires and compressed gasses of creation, burned and transmuted in the crucible of her womb lies at the heart of the Western tradition of Alchemy. It is one of the fundamental secrets of this ancient and sacred Egyptian science. 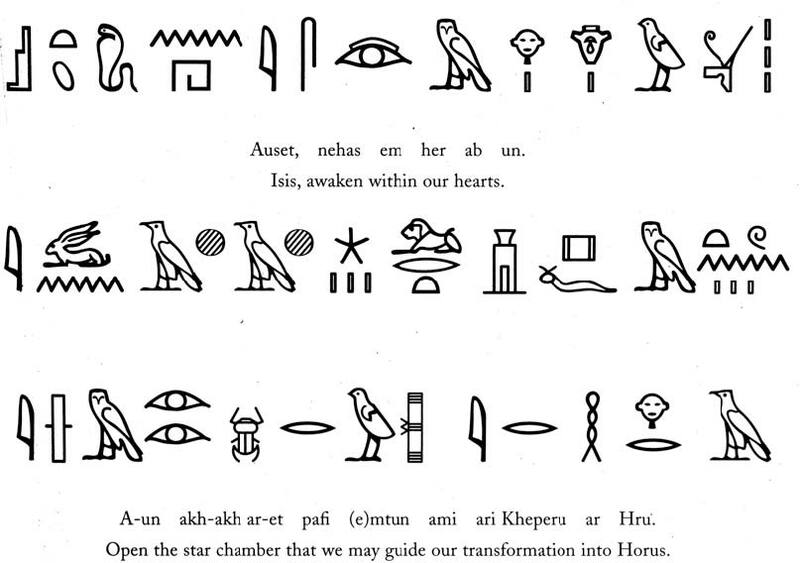 In this beautiful prayer from the Papyrus of Ani the adepts are asking Isis, the universal mother and keeper of the sacred mysteries to awaken within their hearts and open the Star Chamber. From a symbolic perspective the Star Chamber or seat of Isis, is the Milky Way and Center of the Galaxy. On another level it is the pineal center and eye of gnosis (directly felt perception) of Taoist alchemy. In the Indo-Tibetan Tantric tradition, it is the third eye, the wisdom eye, or Dakini eye. It is the secret inner eye that sees in dreams and visions, that sees beyond the veils of corporeal reality. 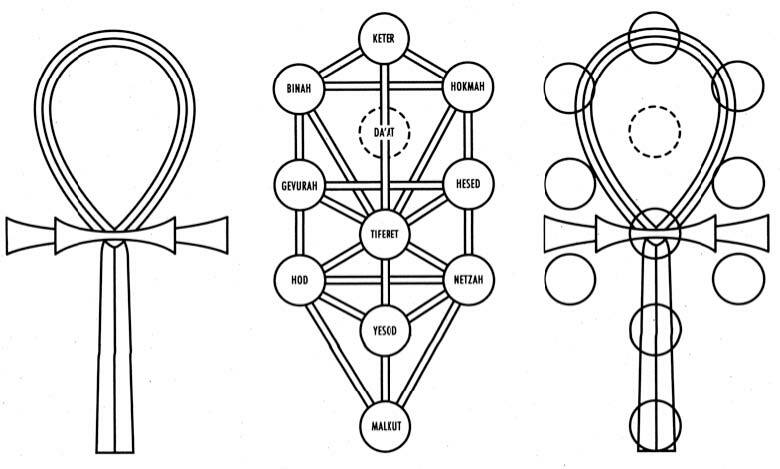 From a Kabbalistic perspective the Star Chamber is the hidden Sefirah Da’at or Knowledge that lies along the central pillar of the Tree of Life or symbol of the world axis. Da’at is the receptacle for the combined Shakti/Shekhina current streaming forth from the first three Sefirah, Keter the Supreme Crown of God, pure and absolute essence; Hokhmah, or Wisdom, intuitive instantaneous gnosis; and Binah or Understanding, revelatory and creative intelligence. 3 Like a radiant crown of light sitting atop ones head, this trinity of Sefirot channel the divine effulgence directly into the pineal center/star chamber. Whether in its appellation as the Star Chamber, Da’at, or the pineal center, it is the gateway to the union of Shakti and Shiva, the Shekhina and the Holy One, blessed be He, human and divine. When we enter the Star Chamber, the veil is lifted. We encounter the Great Goddess Isis in all her splendor, waiting to bring us face to face with divine reality. Isis is often pictured holding the ankh or the symbolic expression of the universal spiritual light as manifested in duality. As seen in Egyptian paintings and sculpture it is through the ankh that the vital enlivening Shakti/Shekhina current is transmitted. 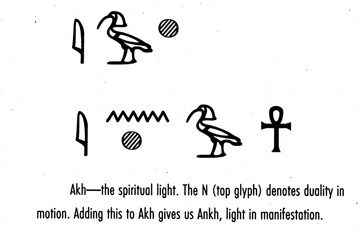 From the above illustrations, we can see how the ankh is an early representation of the Tree of Life. The Tree of Life is the glyph or composite symbol that lies at the heart of the teachings of the Kabbalah. 6 Through personal contemplation upon the symbols of Isis, the Kabbalistic Tree of Life and the Hindu Chakra system, some fascinating insights into the nature of the Galactic Alignment have emerged. But to fully comprehend these insights one must understand the ancient Egyptian teaching of “ As Above, So Below” or Antropocosmos; that what manifests in the outer world manifests also within the Earth itself and on the inner realms within our own beingness. The ankh, the Tree of Life and the Chakra system are all symbolic representations of this universal pattern or expression. Each have their unique characteristics but what is most common to them and important in the context of the Galactic Alignment is the central pillar, the central channel or the djed pillar, the direct path of emanation from and return to the divine source.